I have thus spent some time during the last 2 months explaining on the 'phone or via e-mail that I was not yet an MEP and (until Friday 2nd March) was still actually working in a full-time job unrelated to the European Parliament/the Liberal Democrats (a big thank-you to my former employer hanover for their understanding during this time). However, the becoming-an-MEP process is almost finished now. 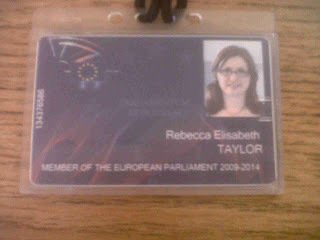 Yesterday I filled in and signed a variety of forms at the European Parliament in Brussels* and received my MEP ID badge. On Wednesday 28 March, I am due to be officially sworn in. * The eagle-eyed among you may note that this week was in fact a Strasbourg plenary week for the European Parliament; I was not able to attend this plenary due to not officially being an MEP yet.